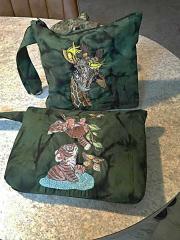 There are two cool textile bags executed by Ruth Theriault from practical fabric. Both of them are made in same color scheme. Their background looks like forest and it is very good idea for chosen embroidery sample. It is Tiger cubs playing in jungle embroidery design. This picture shows two little tigers looking to each other. So they seems to be in forest. 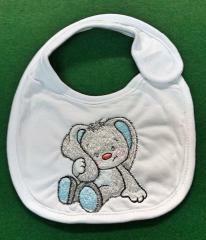 This is fragment of pretty baby bib made to protect his clothing from stains while eating. 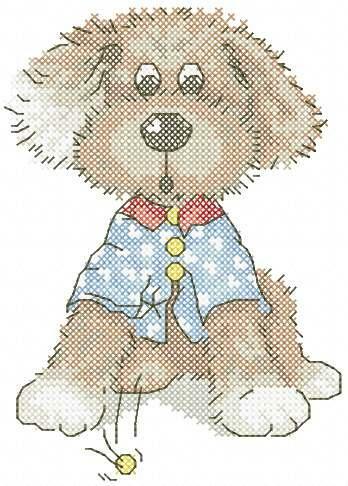 It is decorated with cute picture in cartoon style. 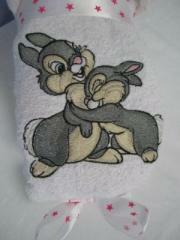 It is Snail free machine embroidery design. It shows merry little snail which looks something interesting in front. This bib is part of good set consists of four items. They all are embellished by same picture. 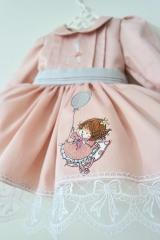 This is pretty dress for little girl made from bright fabric and decorated with lace. 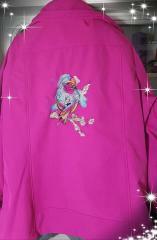 Its chest part is also embellished by picture based on Happy walking duck embroidery design. 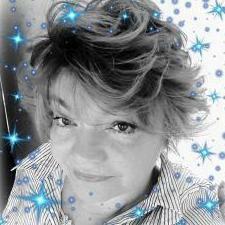 Author tried to choose sample which will have same color scheme as dress’ background ant it was success! In this cute clothing little girl will definitely attract much attention at home party or in kindergarten. This is nice textile basket which is suitable for keeping small accessories or other little things. It has quite simple but very attractive design. 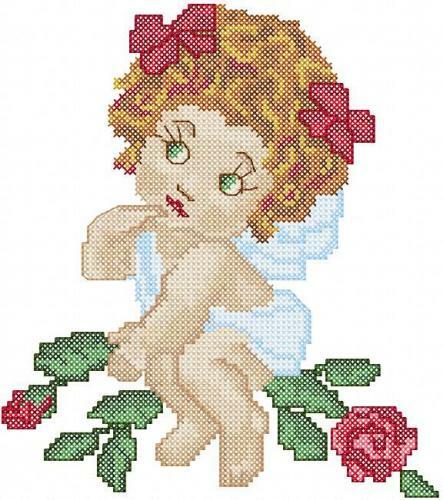 Light background fabric is decorated by Cute girl applique free embroidery design. Originally this embroidery sample was executed in some colors but author chose more easy color scheme to underline beautiful simplicity of this work piece. 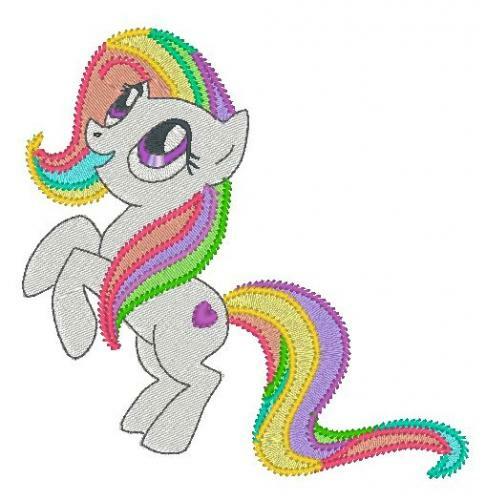 Here is a very cute little girly pony. 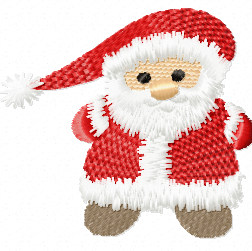 (I had already loaded there in a while but in the wrong forum) good embroidery. 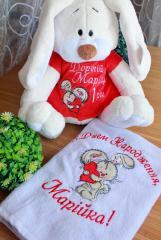 Embroidered items for children are one of the best options as a gift. Bright and unusual, it will allow your child to look bright and true. 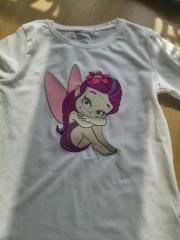 Cute pony for children's t-shirts. Easy option to decorate any product. Sewing do not forget to add the name of the child. Give your work a personal style. 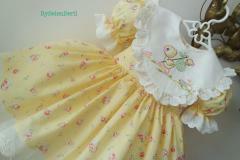 This is pretty holiday dress made by Selen Walker for little girl prepared especially for her second birthday. 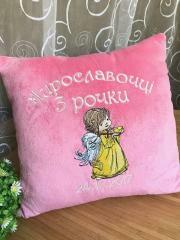 It is decorated with suitable thematic embroidery sample which shows cute little princess with big balloon in her hands. 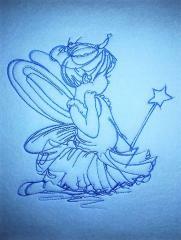 Girl's 2nd birthday 2 embroidery design may be executed in monochrome color scheme as on original picture. Or you may change its shades to others you like more. On this picture you see all necessary things which are on table of modern person. 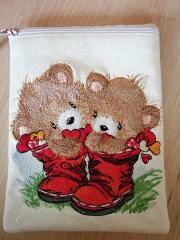 They are wallet with money and cards, smart phone, car key, box for some accessories and practical vinyl napkin decorated by Cuties i love you cross stitch free embroidery design. This pretty picture can raise your mood at every day even when you have some bad news. 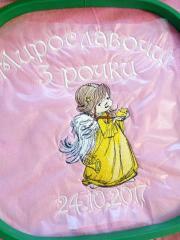 This is beautiful dress for orthodox ritual which is making for little babies. 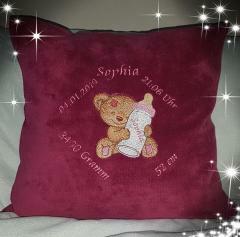 Date of event and name of child are mentioned here. 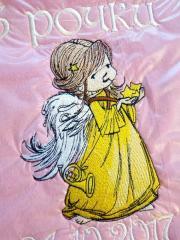 Work piece is added by Stars angels 2 embroidery design which is so suitable for this case. These embroidery samples look like pencil sketches which are made by true master. They perfectly show all emotions on angel children’s faces.